Mike Koenig, a Holocaust survivor, is a retired engineer who lives in Israel. In 1943, for a period of several weeks, he smelled in his hiding place the horrible smell of bodies being burned on pyres in the nearby death camp, Treblinka. When the uprising took place there in August of that year in which the escaping prisoners set fire to some of the camp's facilities, Mike saw a huge column of smoke rising skyward over the camp. Mike describes in chronological order his family's tortuous path through three ghettos (including the Warsaw Ghetto), his survival of an aktzyah and eventually finding a hiding place. The Koenigs managed to stay together throughout the years of the Holocaust. At the time when whole Jewish communities were destroyed and only scattered individuals survived, this represents a statistical rarity. The author presents a powerful collection of material to document the atrocities which took place in Treblinka, and endeavors, in prose and in poetry, to impart to the reader the impact the Holocaust has made on his world outlook. 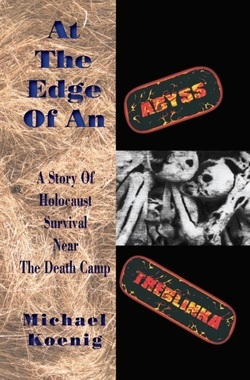 Having survived so close to the Treblinka death camp, the author of At The Edge Of An Abyss presents not only a unique story, but also provides a rare perspective in the annals of the Holocaust.